I plan on buying a 3D printer next month! Please discuss 3D printers, 3D printing, question or issues about 3D printing here so it is easy for enthusiasts to find. Thanks! Yes, please discuss. My buying plans are more in the future but I am interested to hear the discussion. Hey there! As it turns out, I literally just bought myself a 3d printer with my tax refund. Really mandatory: an enclosed, vented printing space. That stuff smells horrible and is toxic, and this is going to live in my bedroom. I can put it near a window to vent. The Flashforge fulfilled almost all of my criteria, and, though expensive, is a good fit for me, I think (I've had it for all of 2 days). Pros: Not as big as I feared, so it can sit on my desk by the window, and still has usable desk space left over. Plus it can print in bronze, metal, and wood, plus the two standard types of plastic (ABS and PLA), and the softer, rubbery plastic. The lights can be turned off, though I don't think it can go any quieter, so don't expect to stick this in the bedroom and print at night. It's nearly completely enclosed, with a nice front door that makes it easy to keep the fumes contained. 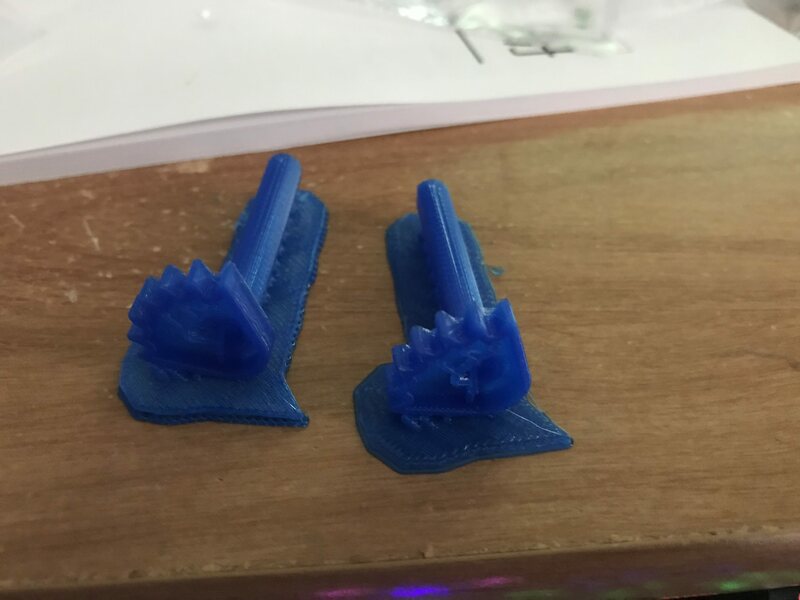 Print quality/resolution is very nice, I did two of their test prints and very little sanding work needs to be done. 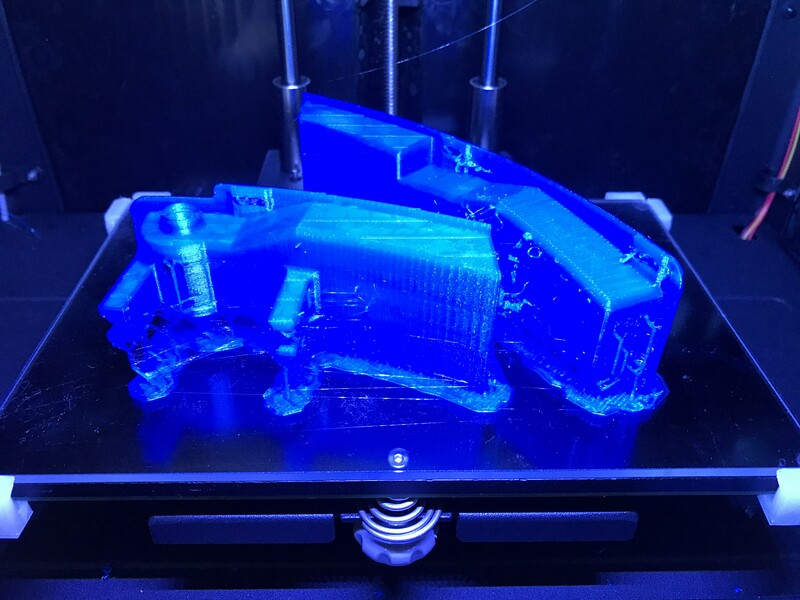 I'm currently printing out my first "real" set of objects, and will report back on the quality of those. Dual extruders means you can load two colors of filament and make models that incorporate both colors at once. One of their test files illustrates that. Cons: It doesn't take what seems to be the standard 3d model file directly, however, it comes with some software which will take the models, let you arrange them on a virtual printing surface, and then save them in the correct file type with all your print settings done (like infill, very important). That software is easy and reasonably intuitive to use, so I was easily able to take the file I got online, set it up, and get printing on them quickly. Your options for getting the print files into the printer are SD card (and how many people have a computer capable of reading an SD card? I happen to have a laptop that does, but it means prepping the files on my desktop, then using a USB drive to go to laptop, just to transfer the files to the SD card), or USB cable (in my particular case, I would need a very long extension cable to reach the printer, but I might invest in one). As I mentioned above, it's not quiet enough that I think I could sleep while this thing is going. I mentioned in Slack that it sounds like an old dial up modem took some bad drugs and is now having a freak out. 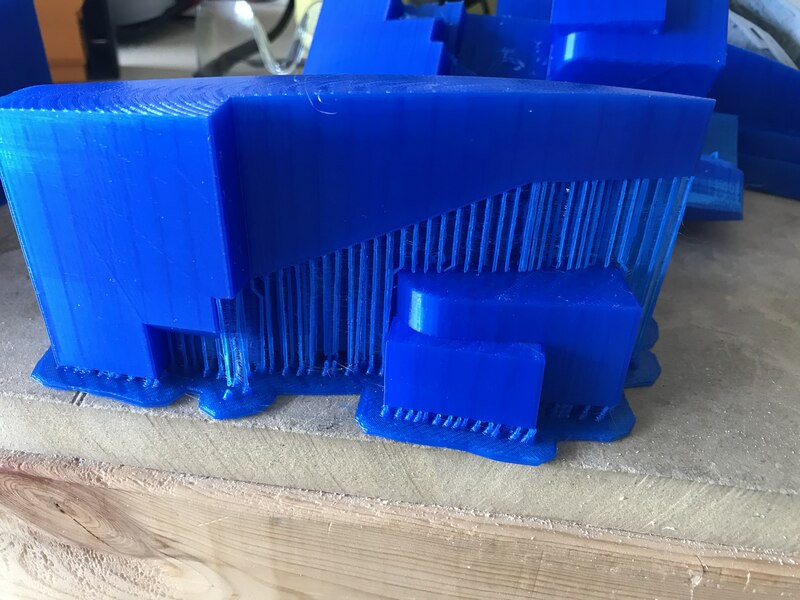 When printing with both extruders at once, it leaves behind a LOT of threads, so there's more cleanup than on a single-extruder model. It's expensive. But I also feel, if I really want to get into this, I shouldn't get a $200 stopgap and find that it doesn't meet all my needs, so I have to buy the $900 model anyway. Setup wasn't as easy as I would have liked. The manual is in good English, but the order of steps was strange, and I found myself having to undo some steps to do later ones. But I did get it assembled in the end. So there you go on the printer itself! So far, and again, I've only had it for 2 days, I would recommend it. But then again, it's also the only one I have, so I can't compare. First, think about what you want to do with it. Seriously, come up with a list. If it's not that long, then maybe getting a 3d printer isn't for you. This is a big investment, and letting it gather dust after a month would be a shame. Third, there are a lot of free (and paid) models out there. Pinshape and Thingverse are the two big sites that I see. Maybe existing models will be enough for you, if you don't want to learn CAD. OR maybe they'll be good trainers/tutorials/ideas for you. Let me know if you have any questions, I'm happy to answer! Do you feel the table is big enough? 8 x 6 x 6 in (approx)? I know some cheaper printers (although not enclosed an maybe not having the support of this one) have much bigger tables. You feel you can build most stuff with this printer? I'm super interested because that's the one I have on my short list to get. Yes, at least so far. You can split objects into parts and combine them (glue, nobs, etc), so it's ok that it's smaller. I find the resolution is more important, personally. As promised, here are some pictures of the printed products. 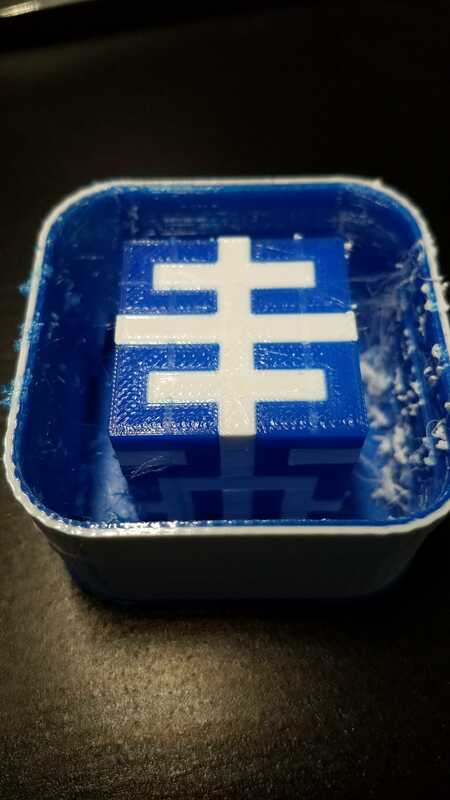 This is one of the test prints, just a basic cube. Not bad. 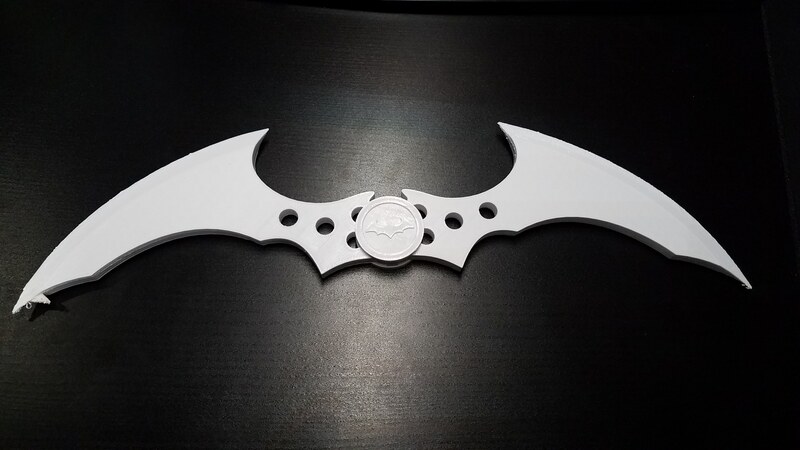 And finally, the required batarang. This was a free model I picked up online. 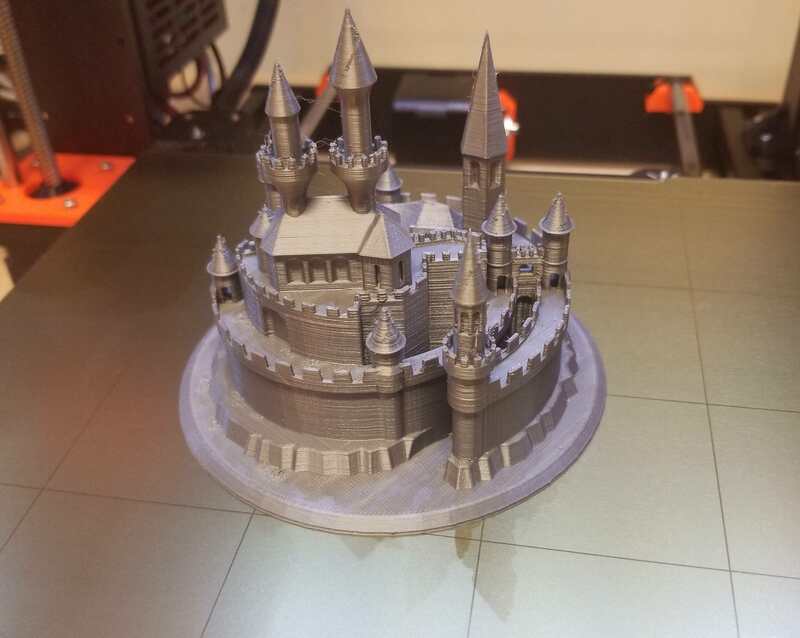 Took me about 5 hours to print the whole thing, at a high resolution. You can see the printer did something funky with the tip here. I think it wasn't hot enough, or the filament didn't advance properly. I could always reprint this part if I wanted to, or clean it up in post. Here's a fun one I made, I tried to replicate the Moon Hanafuda card. Didn't do half bad with my 2 color printer. I've started using Tinkercad online, which is a free, online only (but you can export) CAD program. It's pretty easy to make simple stuff, like that Hanafuda card. Eventually, I know I'm going to want to get into more complicated programs for more complicated shapes. I'll be using it to print out droid parts. I could build a chopper and BB-8 body mostly out of 3d parts. I just dread finishing so many pieces that will need to be glued together but that card looks pretty good. A couple of coats of filler/primer spray might even do the job! Banana or it didn't happen. 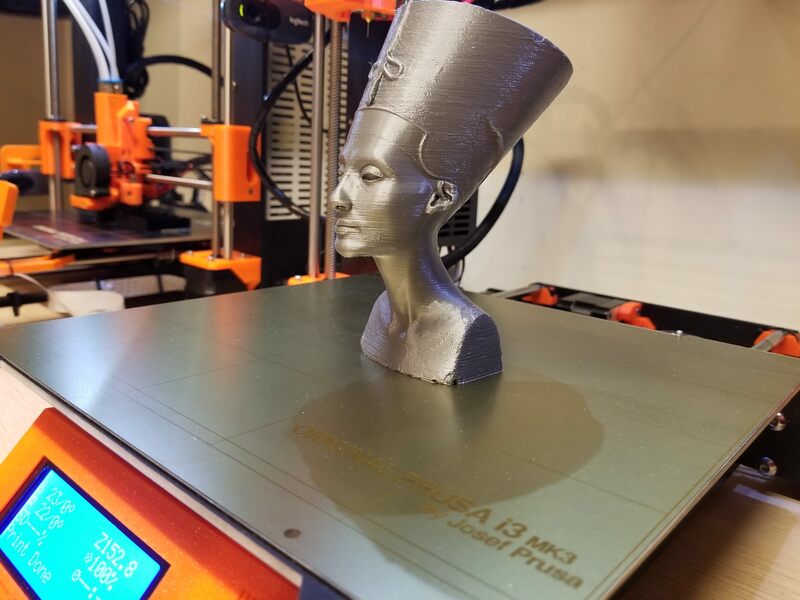 I started out with an inexpensive Chinese printer early last year (a Tevo Tarantula), and then upgraded to a Prusa i3 MK2S - a huge improvement. Overall things were working well last year, when I had time to use the printer, but I made the mistake of buying the Multi Material Upgrade -- and that has been a lot of grief. It was a poor design, not ready for primetime -- and I shouldn't have bought into it. Like an idiot, I got rid of the old parts so I can't simply go back to the stock, but I can bypass the MMU by removing the multiplexer and feeding filament directly. 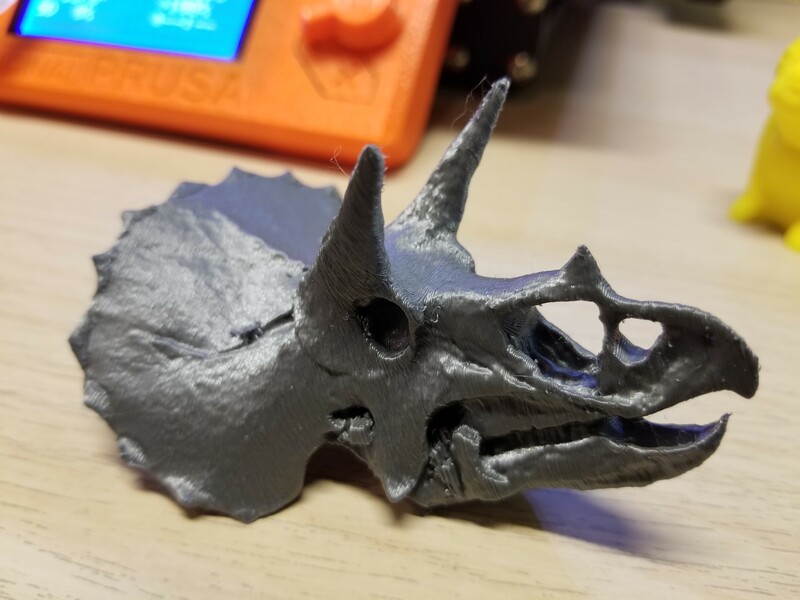 MMU problems aside, I do like the Prusa. Being a sucker, I finally bit this week on the i3 MK3 and hope to have mine in late April. 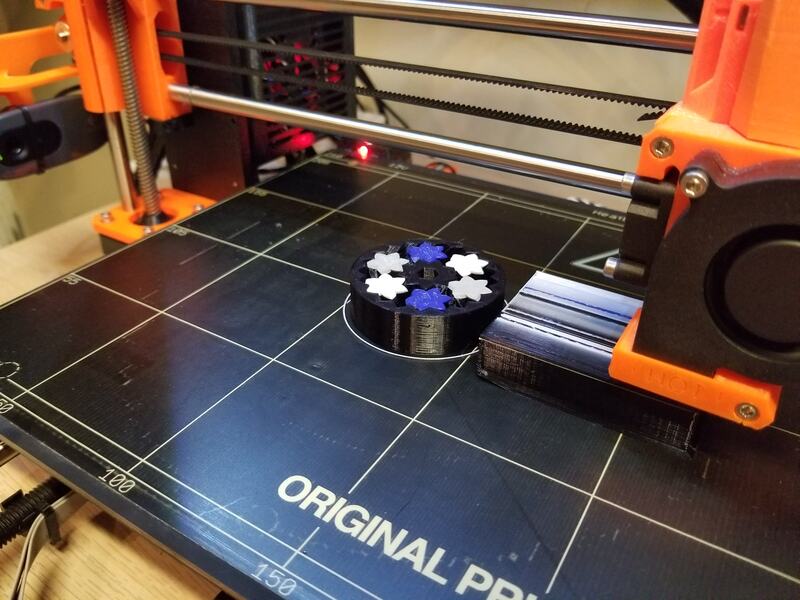 I plan on selling the MK2S MMU to help subsidize the new gear. In the meanwhile, I'm back to doing some simple prints -- e.g. figure holders for Gloomhaven, but plan on experimenting with some larger prints this month. Here are a few different prints, some pre-MMU and some more recent. The problem is once we are able to print most things corporations will seek to destroy 3d printers. War will breakout across the globe. 3d printed guns, tanks, and warbots will flood the streets. Everyone will be armed with easily replicated weapons. 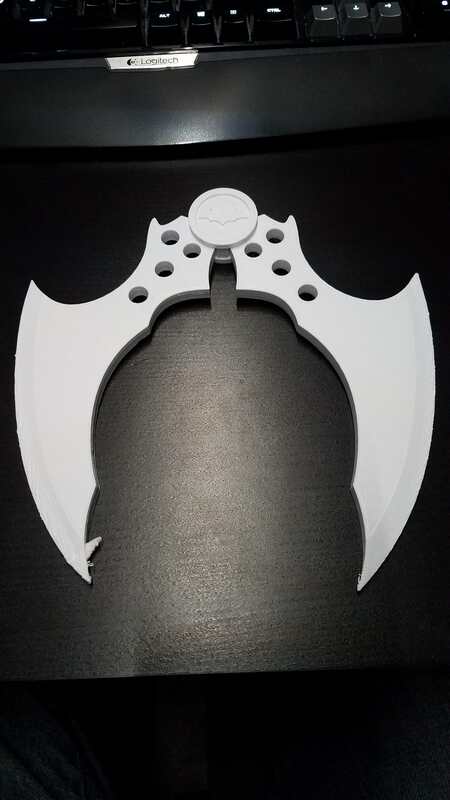 Even now people are printing knives and guns to protect their printed action figures and screws. You can bet that Lego is sending assassins to kill people printing legos. This is why the price of lego sets have increased so much. They need the money to pay for assassins. These guys are as bad as Disney when in comes to murder. So just be careful that everything you print is legal. If it isn't legal be prepared to defend your creation. I got a Flashforge Creator Pro this weekend as well. 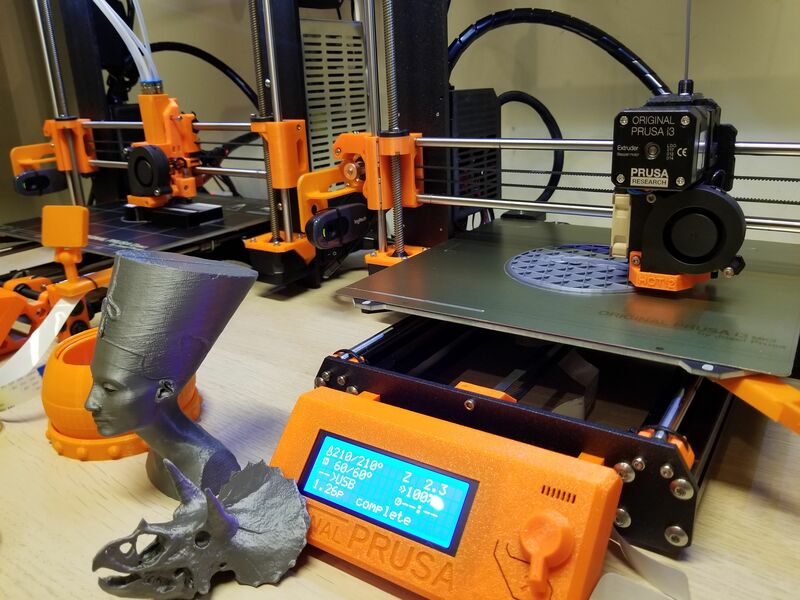 I really wanted a Prusa MK3 but the wait time is REALLY long right now! 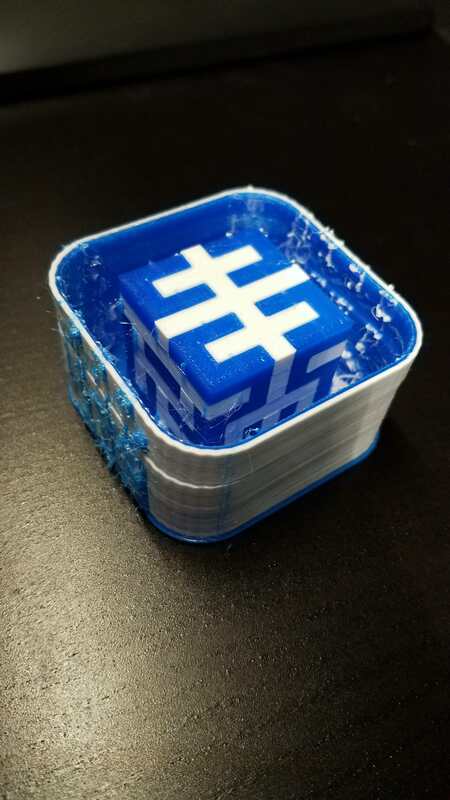 I was able to get it set up and print the test cube that taharka printed. I did have a couple of issues 1) There was an extra piece of packing in the back of the machine that is not shown in the unpacking instructions so when I went to move the bed up t o remove some, the z-axis switch got moved. I took it off and fixed it. 2) The SD card that has some 1st run utilities on it had some weird descriptive names but the stuff was in there. Unfortunately, my work laptop sd card slot is locked out so I had to order a USB sd card reader/writer from Amazon before I can print the next object. PS I also ordered a glass bed replacement because it was very hard to remove the test cube once the bed was cooled down. I had to heat the bed back up to get it off! Congrats on the new printer! On Friday I received my MK3 and I love it so far. 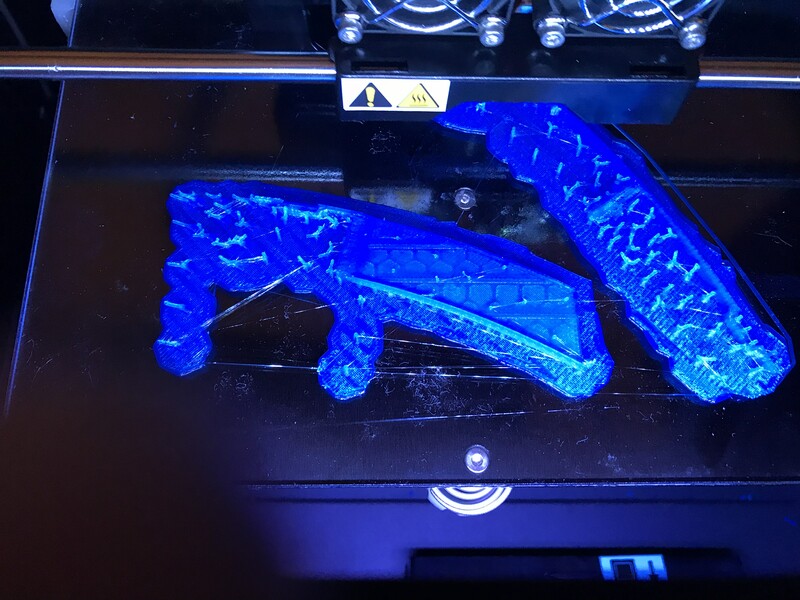 I also have the MK2S with the Multi Material Upgrade largely working now too. It works fine with single filament, but the multi material can be finicky - a flawed design. Someone on the Prusa forums remixed the multiplexer (feeds the four filaments into the one hot end) and it works MUCH better. The last image is a four color/filament print. Not the best choice of colors but its what I had already set up. 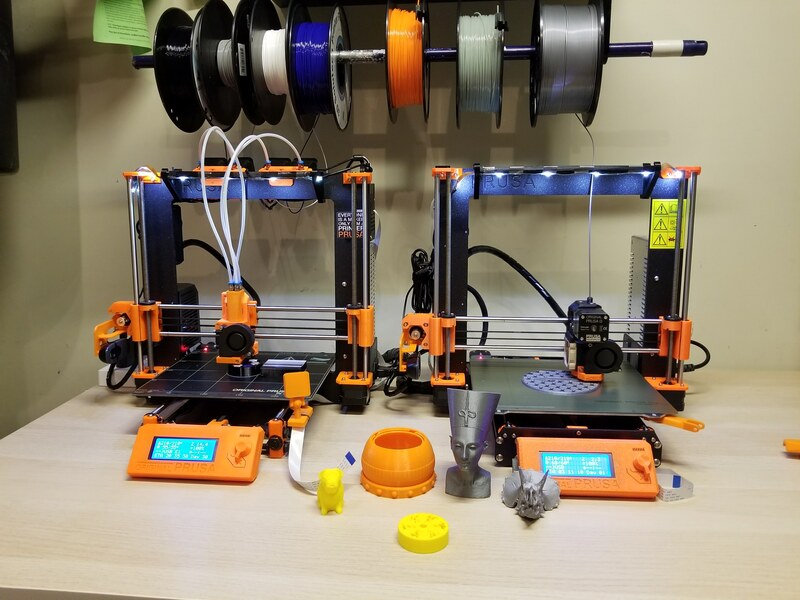 I'm likely going to sell the MK2S but it is cool having two printers (although the MK2S seems so loud compared to the MK3). I should have added -- I highly recommend Octoprint. I have Raspberry Pi's on each of my printers running the octopi. Control the printer entirely via the web, upload .gcode files, monitor prints -- even add webcam(s) to monitor the prints. So, forgive my ignorance, is there a way to get rid of what looks like lines on the outside of the sculpts, a higher resolution printer maybe? Or is that something that exists on all 3d printers currently and you have to sand smooth? I think that post processing is required for 3D printing just as it's required for a lot of other fabrication techniques (injection molding, die casting, CNC, etc). It's extremely difficult to find a fabrication technique which doesn't require it. Yeah, no matter how fine you print (some printers can even get down to .05 mm layer height! ), you're going to have lines that require sanding/priming/etc to smooth out. 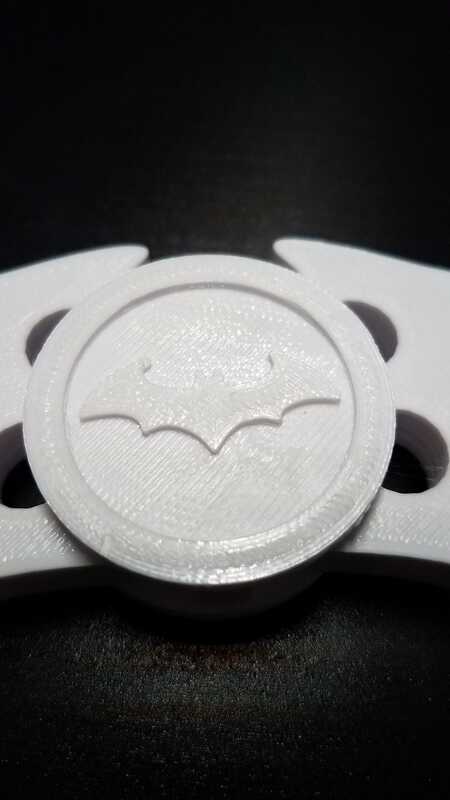 You can use an acetone vapor bath to smooth some out if you are printing with ABS filament. 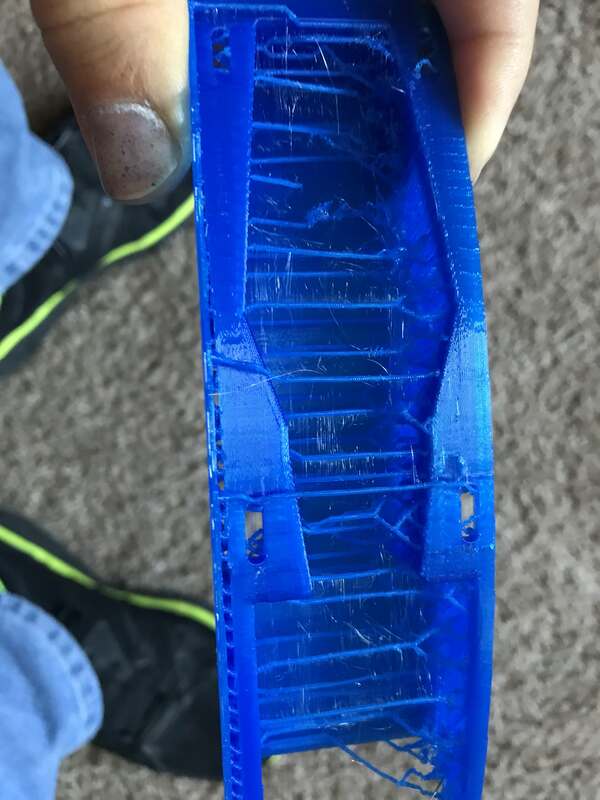 It's really just slowly melting the item you printed so you need to be careful. Search Google images on "abs acetone vapor bath" and you'll see some Before and After pics. 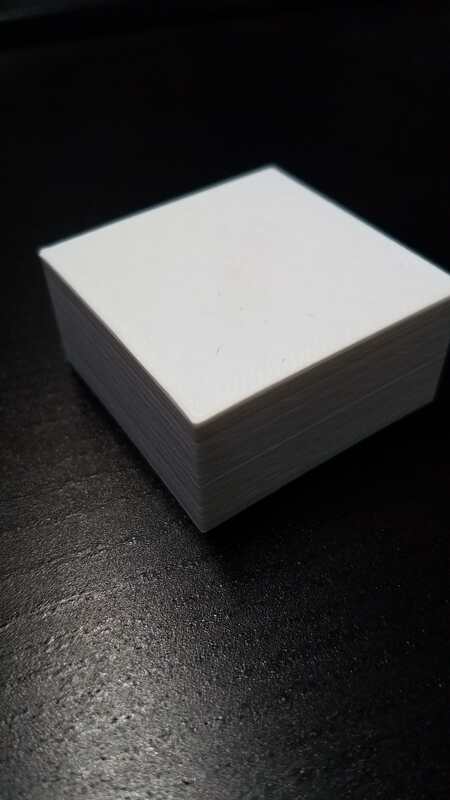 I haven't printed using ABS, yet. It's not easy getting to the window in my office to open it and ABS smells. I'm using PLA on my new printer, which is a Tevo Tornado. It has a .05 mm layer height and printing at that "resolution" sure takes long but I'm impressed with how smooth the outside of the prints is. 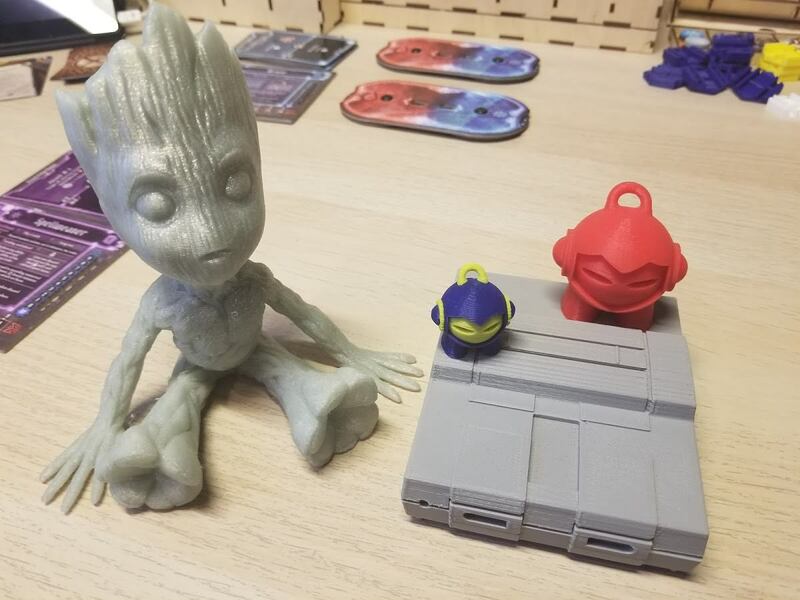 Besides mods for the printer itself, I'm mainly printing gaming items for table-top gaming. I'm not real worried about the layer lines. I started a print of a Gloomhaven mob counter when I left for work this morning - sure hope it comes out well. 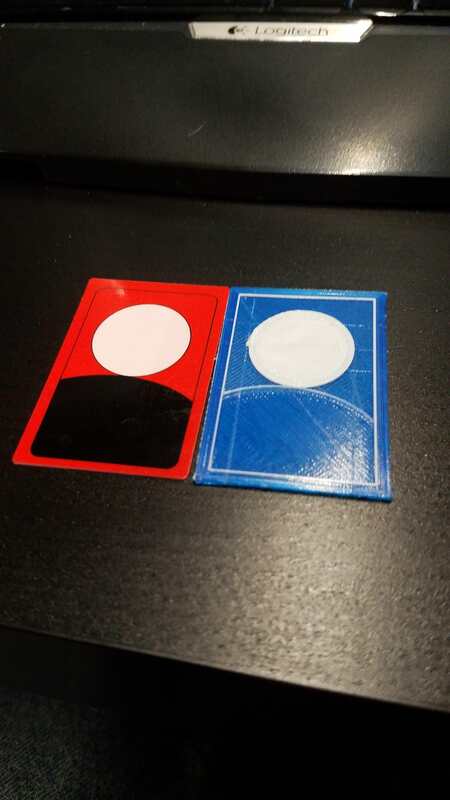 I'm hoping my manager gets a resin ( DLP or SLA ) printer and I'll use that if I want to make something smoother. 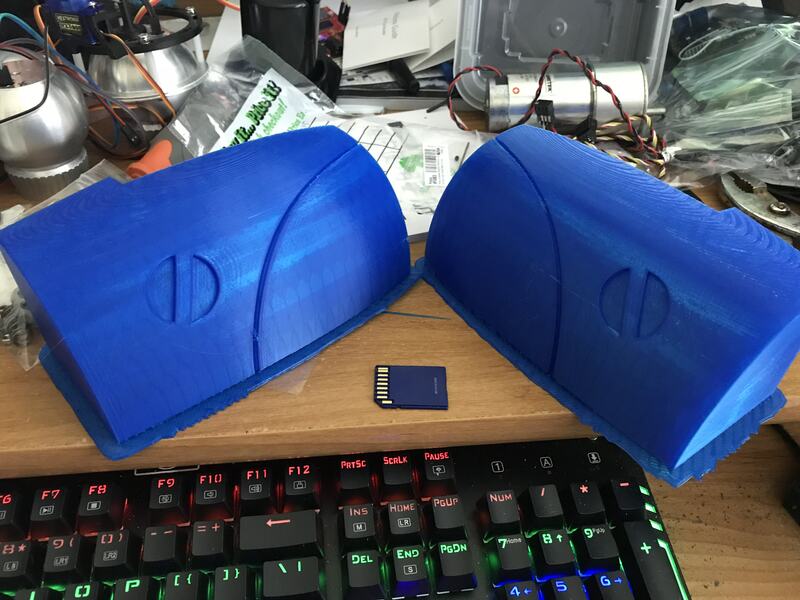 Besides mods for the printer itself, I'm mainly printing gaming items for table-top gaming. So true. Most of my prints are mods, trinkets for the kids, or board gaming items (which I don't get to play). The adage of "you have a 3D printer so you can print more parts for your 3D printer" is very true. I too have only done PLA. I'm going to try out PETG - seems to be a bit of the best of PLA with some of the benefits of ABS, but none of the downsides (smell and difficulty with temps). I haven't done any tuning and the base quality seems just crazy good. See, that make me want a printer. But then I know that I'd just wind up printing all kinds of figures and crap, and man, do I need more tchotchkes sitting around? The idea of using it to pimp board games is super appealing, but likewise, I don't get to play board games these days, so pimping them seems like a silly idea. Custom chess pieces with space inside for weights AND enough spare pieces to promote pawns. Those alone make the idea dangerous for me. All of our storage would be filled. My manager has a roll of PETG that he was supposed to bring today. 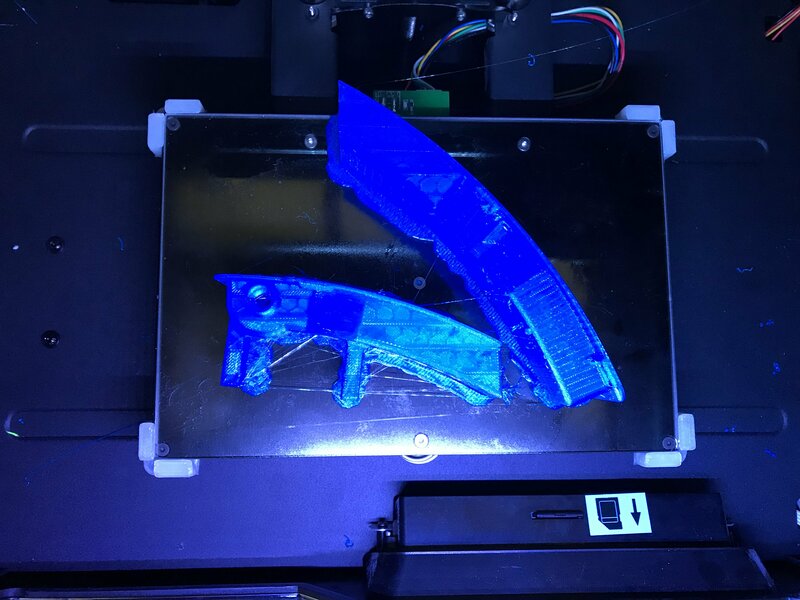 I'm printing a couple gaming things for him and I want to try PETG on my printer so it works out great. I'm working on getting rid of the stingies that are left behind when the nozzle moves from section to section. I messed around with the retraction length and speed this morning before kicking off a print that would normally be covered in stringies based on the slicing. We'll see how it went when I get home. 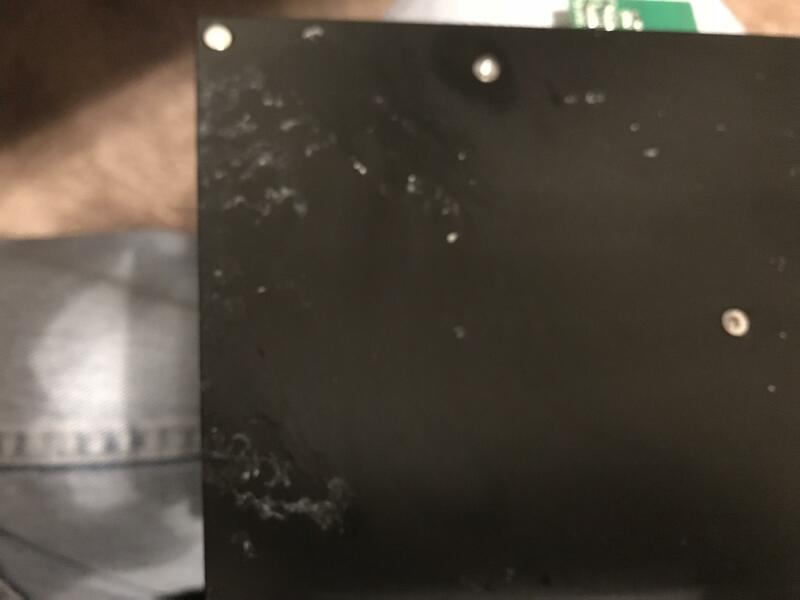 Aside - I gave my RetroPi to a friend right before I got the printer. His kids aren't using it so he's giving it back. Soon, I'll have Octopi and a camera set up. Woohoo! Update - I have my old RetroPi back from my buddy ( RaspPi 3 ) and now have OctoPi installed on it. It's working like a champ. I switched over from using CraftWare for my slicing to Cura since it easily interfaces with the OctoPi. It's nice not having to move an SD card back and forth from the desktop to the printer. I don't have it on WiFi, yet. It won't connect on boot-up to my "hidden" SSID or my non-hidden SSID. The "hidden" one is the one that has access to my internal network. After booting up, I can get it temporarily connected to the non-hidden ( guest ) SSID, but that doesn't help me. I used to live in *nix, but haven't even messed with it in a decade or more so I'm not sure how to fix the issue. I'll just look at this as an opportunity instead of an impediment! I've already done some research and tried some things with the "octopi-wpa-supplicant.txt file", to no avail - setting up the SSIDs and country code. Moving to Cura fixed about 95% of my stringies* problem. I went back and checked my CraftWare settings and I hadn't saved the retraction settings. Oops. It probably would have worked in CraftWare had I saved the settings, but I'm not worrying about that, now. I printed a few more things out for my manager and keep getting impressed with how they are turning out. 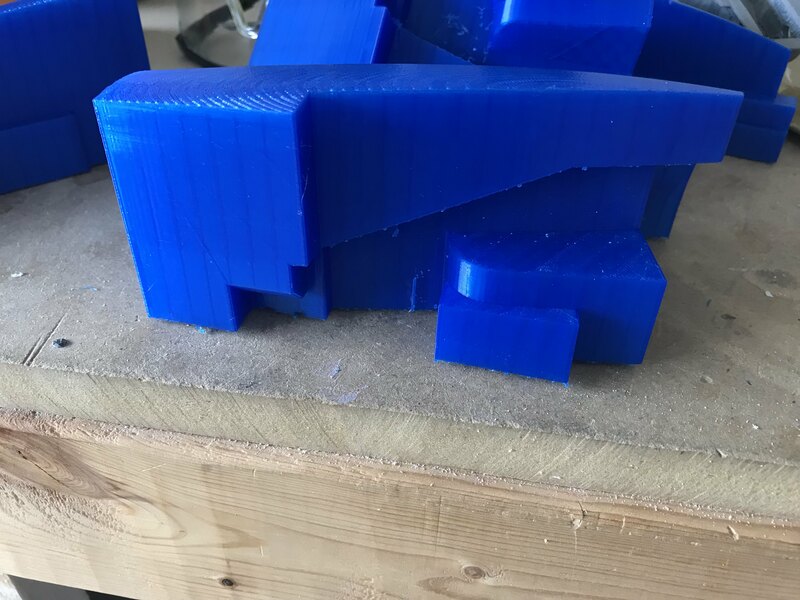 The bed on the Tornado isn't real flat ( known issue with them ) so I have to kinda plan where on the bed I want to print to get the best base. I have switched to using AquaNet to help with adhesion and that has helped. Time to order a camera and get the OctoPi working on WiFi. * not a medical condition. Where did you get the file for this print? I'd like to give it a go. What camera works with the RasPi 3? I want to get OctoPrint running too, but I need a camera (well, I could get it running now anyway, but you know what I mean). BEP - Prusa has it pre-sliced (but I don't know how it will print on non-Prusa printers), the original is on Pinshape. 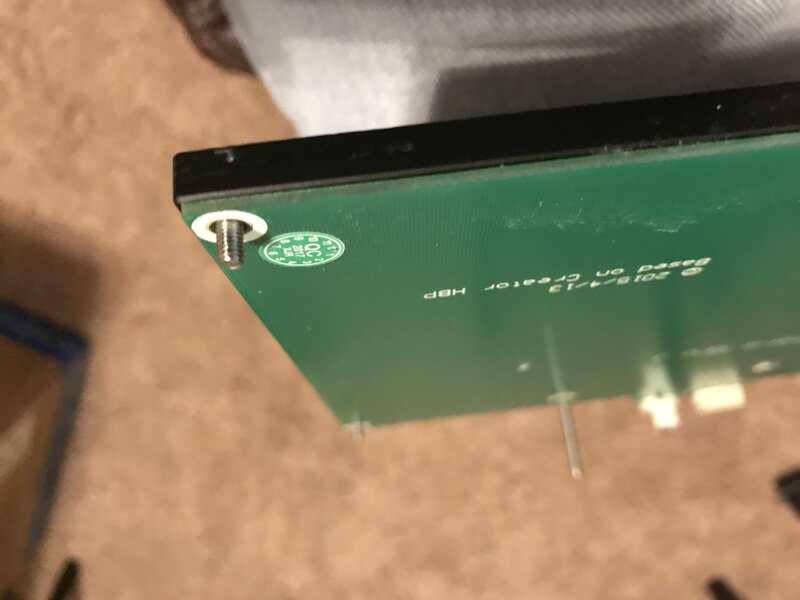 Taharka - Any Raspberry Pi camera will work. I've tried a few off of Amazon - I'm currently using two of these on my two Octopi setups, and they work well. I also bought a wide angle lense camera but haven't switched out either of the existing cameras for it. This should in theory capture the full print bed from the mounts I printed. 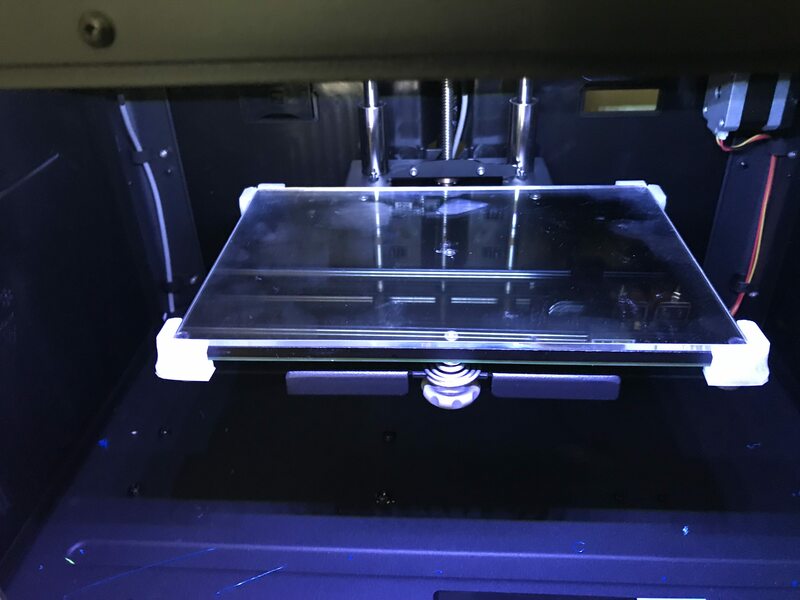 - Raspberry Pi cameras - per above, placed on a printed mount connected to the printer bed (moves along the Y axis). 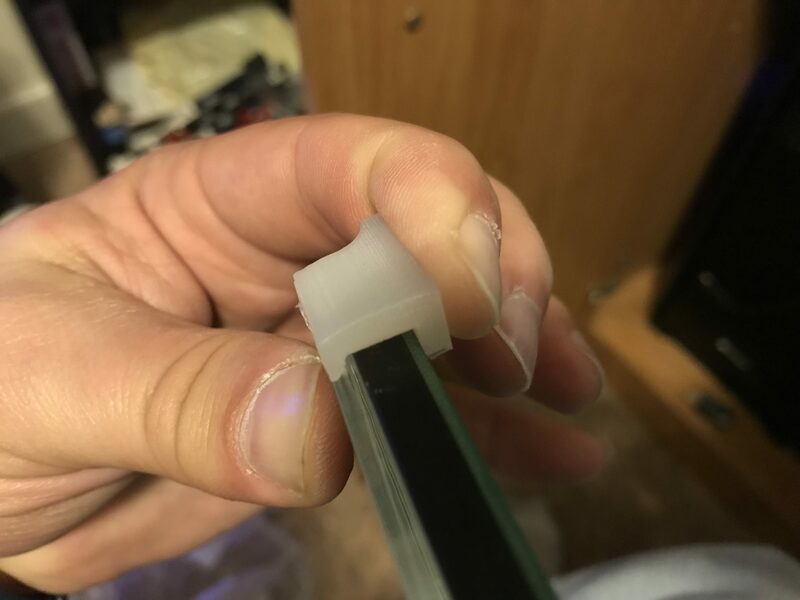 - USB webcam - I'm using cheap Logitech C270s that I removed the base, printed a mount, and adjusted the focus for being permanently mounted (easy to open the case). These are mounted on the Z-Axis (moves with it vertically). I used to have this overhead, but I like the Z mount. I like having the two angles of the print. Octoprint only shows one webcam, but I set up a page where I can monitor both. Thanks for the castle link. I'm going to start with a cheap USB camera for now. If I stick with this, I will go for a nicer setup. Are the cameras in the pic above of your MK3, Marlin? I don't see them, but they may be well hidden. I'd like to see how you have them all mounted. Edit: I was showing your printers to my manager and now I see the camera mounted up front. 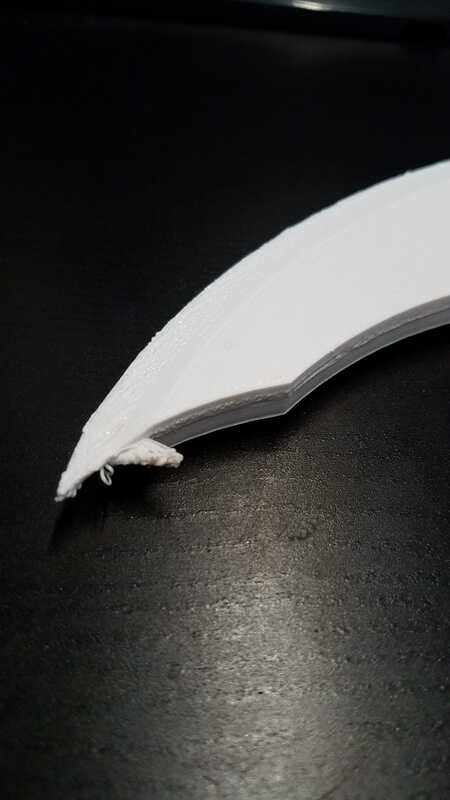 Well, I had issues with getting prints to stick to the starter bed of my Flashforge Creator Pro but I now realize that was my fault on orientation. Before I learned that I converted to a glass bed! 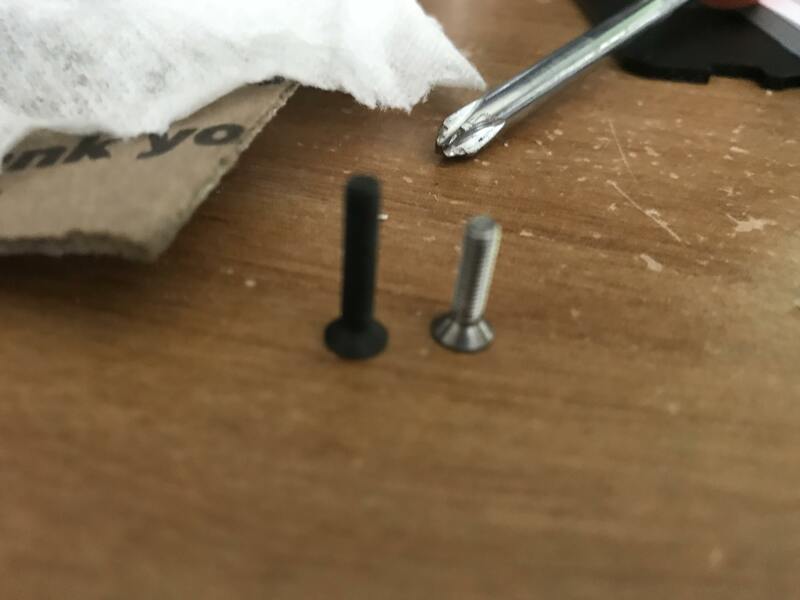 First issue, later manufactured printers come with these corner screws that are shorter than needed. So I had to go out and buy longer ones to get the included corner holders on. The shipper would have sent them to me after I messaged them but it was not their fault. The kit also included new leveling springs as well. And completed! Once I learned that printing most stuff with a raft solves most adhesion issues I was on my way. A sliced utility arm backplate for R2. Still working on what needs supports and what does not at that time.These may not have been needed. Here is the assembled backplate in the utility arm slot. 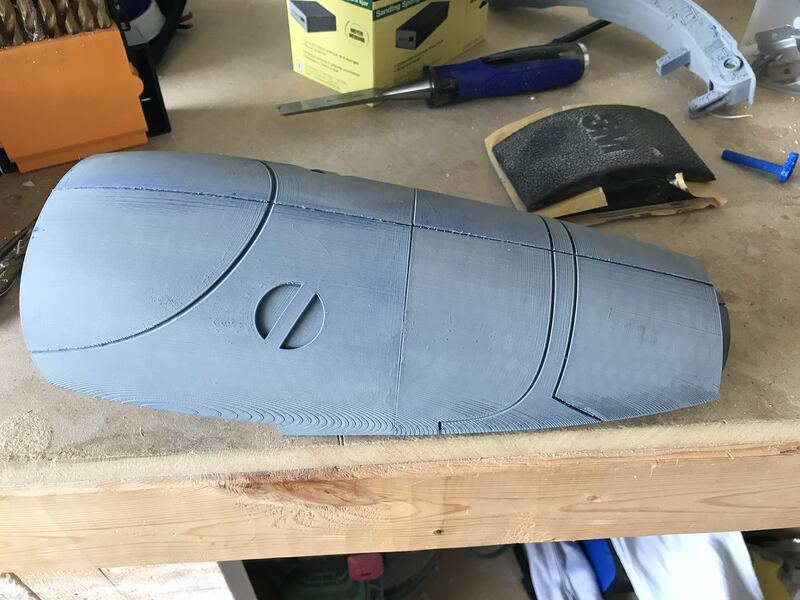 Started also to print a full size SW Battledroid starting with the head. This thing is huge so I had to slice the initial head piece into 4 sections. You can see here is a small section that may have needed support but will be on the underside. 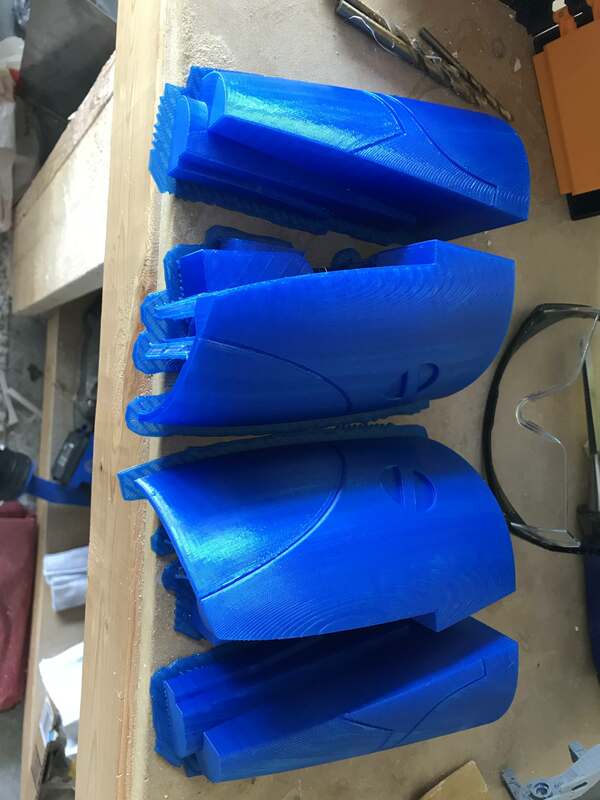 These supports are very easy to remove you can pul them off with your hands but it does affect the smoothness of the print. And the 4 pieces together! 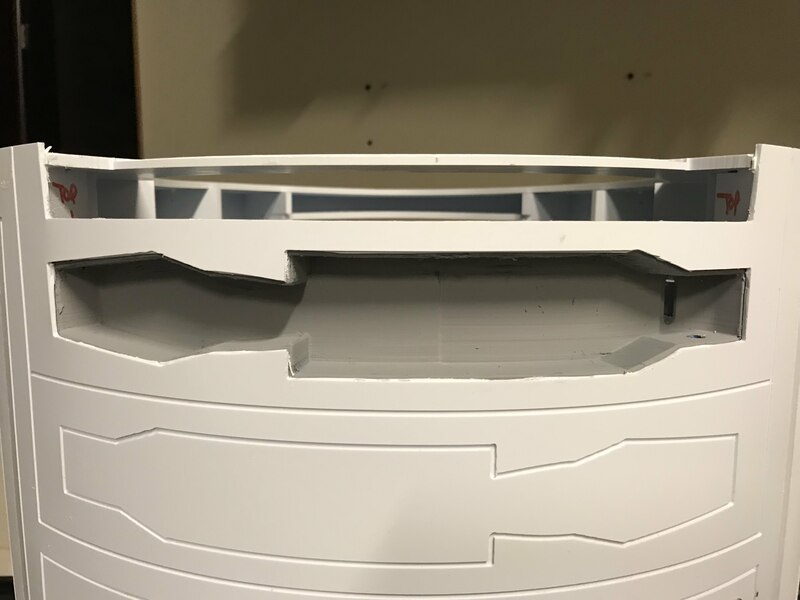 I may have been able to maybe finish the sides where they connect better because there was a definite gap. It can be easily filled and sanded though which is the next step. I also have all the files for a Star Wars Rebels chopper head as well. This looks super interesting but I couldn’t justify the expense for a hobby. I know I asked this before, karmajay, but did you slice the head yourself and work out the joins, or did it come pre-sliced?